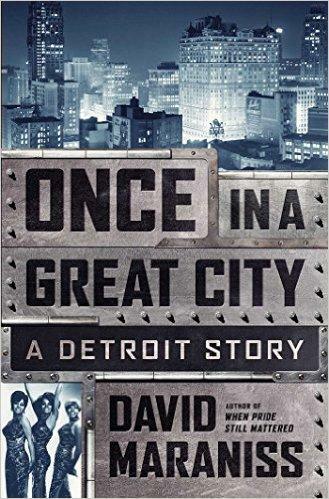 My recent post about how urban planning decisions helped lead to the Motown sound in Detroit was inspired by David Maraniss’ new book Once in a Great City: A Detroit Story. The book takes a deep dive into Detroit 1963, a city that was, although in some ways already in decline, in others near its zenith. It’s a great read, in particularly for the depth of characterization. Too often Detroit writing is a story of heroes, villains, and victims. Maraniss rejects that approach and provides mostly nuanced portrayals of Detroiters that allows them to be the actual real, red-blooded human beings that they are. In his new book, Once in a Great City: A Detroit Story, Pulitzer Prize winner David Maraniss takes a fascinating and engrossing look at the Motor City during this fateful year. Under Henry Ford II (“the Deuce”) and hard-charging salesman Lee Iacocca, the Ford Motor Company was set to unveil its revolutionary Mustang. The civil rights struggle was creating tensions in Detroit and elsewhere, but Mayor Jerome Cavanagh was committed to addressing discrimination and reforming the police. Detroit was about to transform the American musical landscape with Motown Records, whose roster of superstar artists included Smokey Robinson, Diana Ross and the Supremes, Stevie Wonder, and Marvin Gaye. The United States Olympic Committee even nominated Detroit as the American representative to host the 1968 summer Olympics, though it lost out to Mexico City. On the more dubious side, the mafia had a powerful presence in the Motor City, where colorful mob boss Tony Jack Giacalone rode around town in his garish “Party Bus” painted blue and silver, the colors of the NFL’s Detroit Lions. Click through to read the whole review or buy the book.